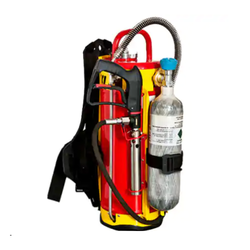 We bring forth an outstanding consignment of Handheld Water Mist Fire Fighting System to our deemed patrons. The offered range is manufactured by our team by keeping in mind the market demands. In addition to this, our team makes use of optimum grade raw material, that makes the range appreciated for its user-friendly interface in various industries and sectors. Moreover, patrons can avail this range after their quality check within the stipulated time frame. 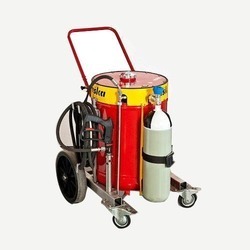 We are pioneers in offering a prime range of Trolley Mounted Water Mist Fire Fighting System to the valued patrons. These offered systems are fabricated at our premises by making use of superior raw material and ongoing production methodologies. In addition to this, our product range is capable of meeting the market demands as they are fabricated as per industry laid parameters. Clients can avail from us these products in diverse specifications as per their tastes and preferences suiting their needs. 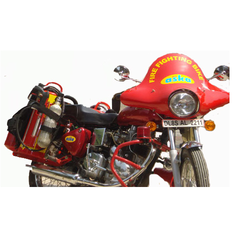 We bring forth an impeccable gamut of Fire Fighting Motor Bike to our deemed patrons. Manufactured with utmost precision, this range is fabricated using optimum grade raw material that is procured from the certified vendors of the industry. Moreover, this range is regarded for its user-friendly interface and excellent performance. In addition to this, this range is accredited for its availability in diverse sizes and detailed specifications at market leading prices. Looking for Water Mist Fire Fighting System ?